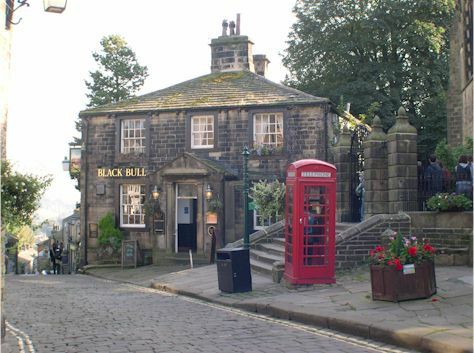 Is The Black Bull in Haworth haunted? The Black Bull may actually be Yorkshire's most famous pub. This 300 year old public house was Patrick Branwell Bronte's (brother of Charlotte, Emily & Anne Bronte) favorite place to drink. The story goes that Emily, his younger sister found some of his manuscripts and with a few minor alterations, found a massive amount of fame as the author of "Wuthering heights". Branwell completely disassociated himself from his sisters, and even painted himself out of a picture of him and his sisters he painted himself. Unfortunately he later became an alcoholic and addicted to various narcotics and died of tuberculosis in 1848. The current owners of the pub have actually kept Branwell's chair, along with many other original features, paintings & ornaments in the bar area. A nasty poltergeist inhabits the bar area and has been known to smash glasses and ashtrays, as well as ring a bell that's hanging above the fireplace. Two figures are often seen in the bar room - one wearing plain clothes and the other in a top hat. In fact, one afternoon the bar staff and a family witnessed their little girl offering sweets to an unseen guest... Exactly where the two men are seen! Much of the activity is also centered around Branwell's chair. He's been described as a nasty character, dark and pushy. Perhaps he's still bitter about the fabled treachery by his sisters..?